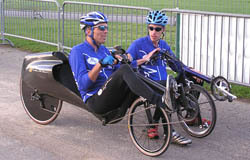 During a big bike event around the lake of Annecy in France two M5 Recumbent teams took the first and second place. The race was a couple time trial along 36.8 km with about 300 altitude metres. Subscibing was also open for recumbent riders. The total number of participants consisted of 700 racing bikers and 24 recumbent riders. First became the M5 team with Edgar Leyten on his M5 Cr-Mo Low Racer and Bram Moens on his M5 Carbon Low Racer in 48 minutes and 5 seconds. Second was another M5 team with European time trial champion Helmut Lechner, on three minutes behind the winners.